I am deeply saddened by the death of Robin Williams, who is said to have committed a suicide yesterday at his home in California. He was only 63. They say he's been grappling with depression and alcoholism for years. My first reaction has been: BUT WHY?? I've found it really hard to digest that this hilarious actor and comedian, who radiated more sunshine than the Sun itself, and who was so incredible at his job could have had such a dark side. After reading up about it I am starting to understand... His friend and fellow comedian, Jim Norton, tries to explain it in TIME's article: "By all accounts, Robin struggled with depression and addiction over the years. So many comics I know seem to struggle with the demons of self-hatred and self-destruction. ... The funniest people I know always seem to be the ones surrounded by darkness. And that’s probably why they’re the funniest. The deeper the pit, the more humor you need to dig yourself out of it." Sigh. There you have it. Below is a photo by Peter Hapak shot for Time in 2011. I really like it. 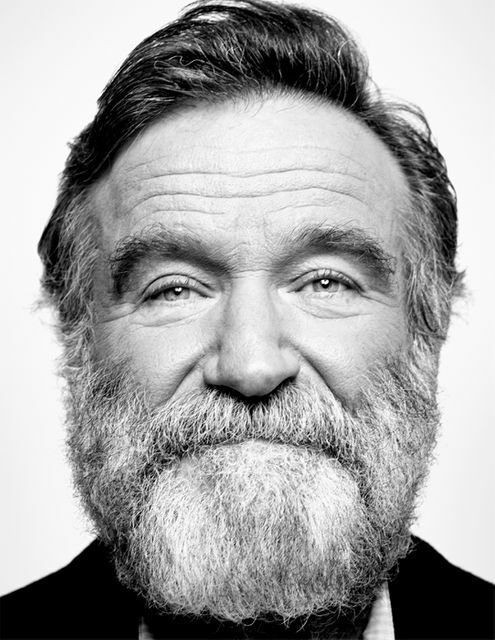 It's not a typical photo of Robin Williams when he is pulling a face or grinning with his whole face. He looks older and more serious. He wears a grey beard and not much of a smile, yet his eyes are still full of sparkle and humour. What a terrible loss. I hope he is finally at peace.